Database entities represent external databases which can be integrated with a flow. To add a database within the portal, navigate to the folder System > Designers > Integrations > Databases	, click the Integrate With	Database	button, and supply the necessary details. 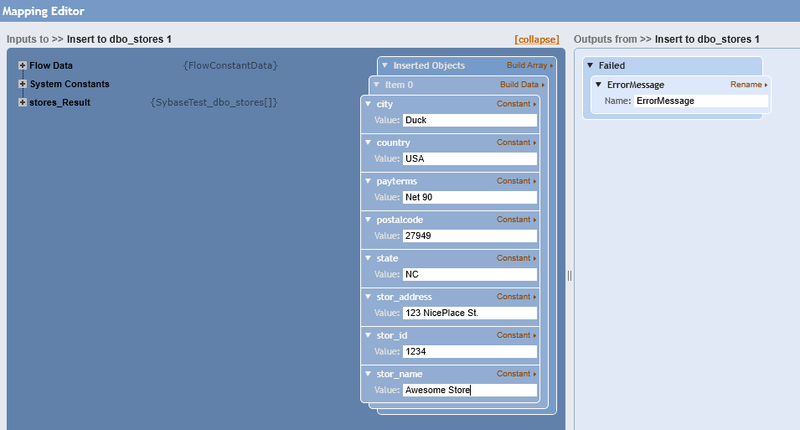 Once a database is introduced, components to query, insert, or update data to or from the database within the Flow Designer can be used. In this Example we are going to show how to Integrate	with Sybase	ODBC	database. 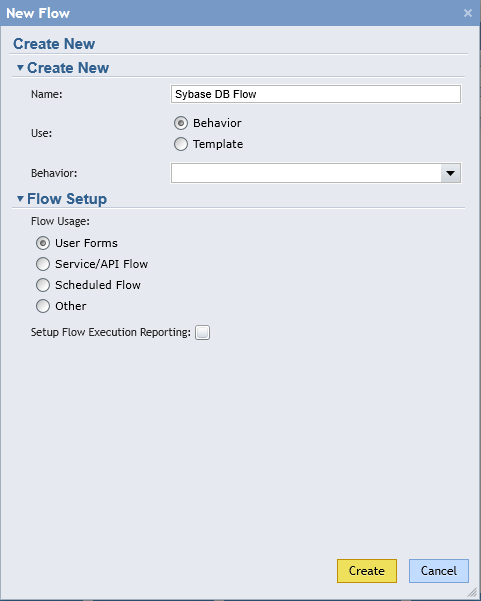 Next we are going to create a Flow to view a table data from Sybase database and add a Row to the table in this database. First, we need to integrate with Sybase	database. 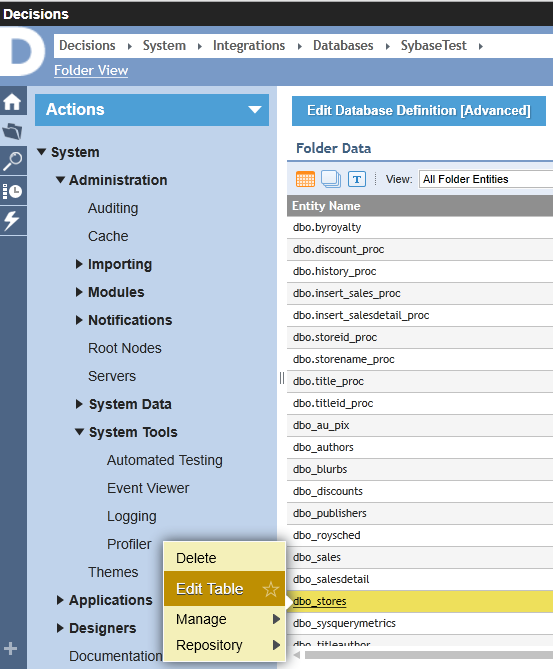 In Portal , we navigate to System > Integrations > Databases	folder and click Integrate With Database	button from the Folder Actions	panel. In the resulting window we provide our database with the Name	. From the Select provider	dropdown we select ODBC	. In the next window we can pick Views we want to integrate with... We click Next	to proceed to the Procedures selection window. In the Databases Folder in Portal our new Sybase	database should be available now. We click on this Database and locate the Table we will work with. In this example we locate dbo_stores. In the resulting popup window we check Is Key	checkbox for the Primary Key	in this table to obtain a full control over the Table ( Insert, Delete, Update ). New Steps	that we can create to use in the Flow	are now available for us... We check the desirable steps to be created and click Ok	to save the changes and close this window. Our table has 7	rows at this moment... We are going to Insert	one row from Decisions to this table using Flow . 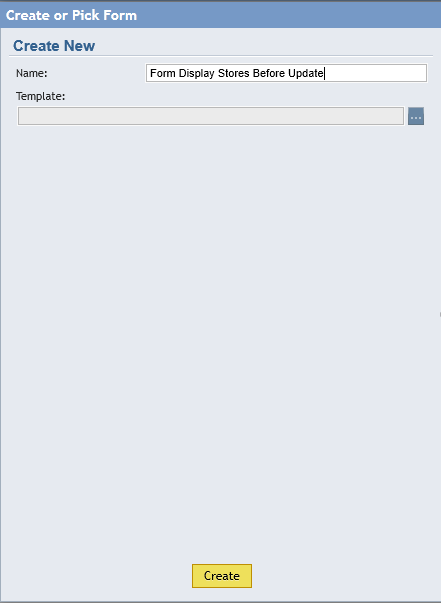 To create a Flow we navigate to the Designer Folder	and click Create Flow	button from Folder Actions panel. 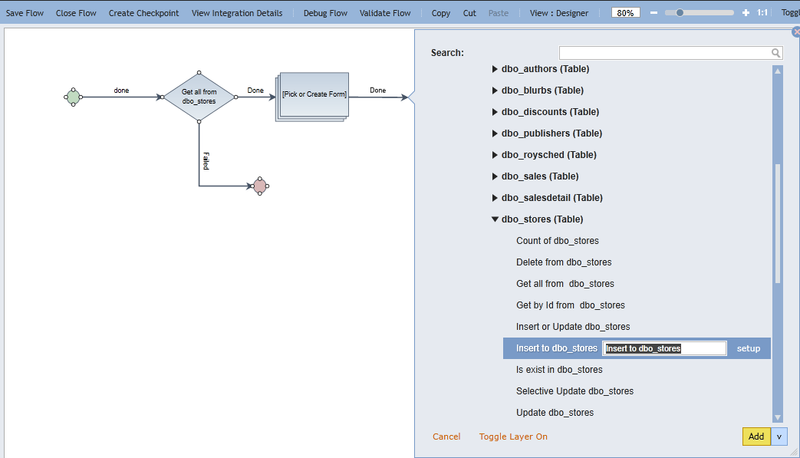 In the Flow Designer we expand Integrations > My Integrations > Database > SybaseTest(Database) > dbo_stores(Table)	category in the Quick Add Step	dialog and add Get all from dbo_stores	step to our Flow . We connect Failed	outcome from Get all from dbo_stores	step to the End Step	in our Flow . 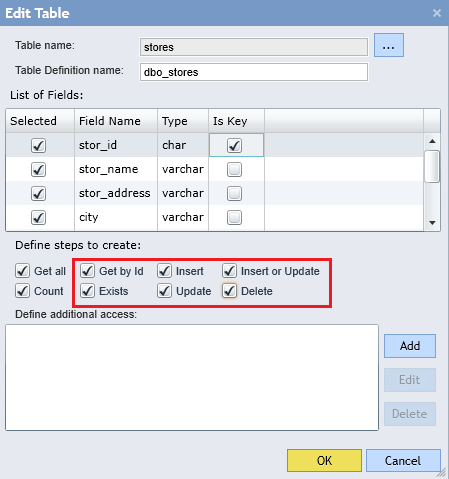 Then, we use Quick Add Step	dialog to connect Done	outcome from Get all from dbo_stores	step to [Pick or Create Form]	step from Flows, Rules, Forms and Reports > Forms[Interaction]	section. We click Pick or Create Form	link in the resulting window. Next, we name our Form and click Create	to proceed to the Form Designer. For our Form we add a control Button	from Actions	category and rename it as Done	. Next, we add Data Grid	component from the List	category in the ToolBox	. We use Type Picker	to provide Type	for our Data Grid	. 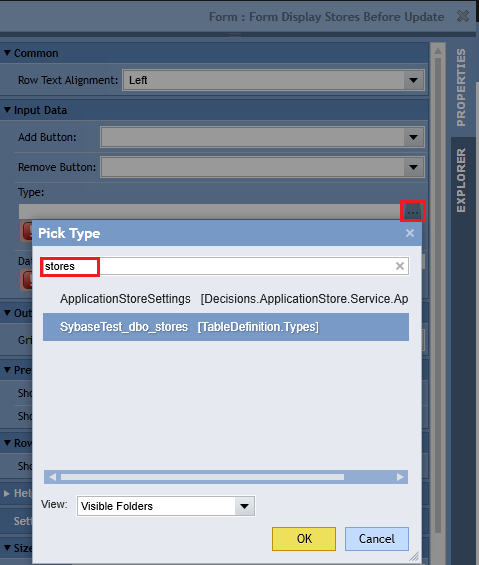 In the resulting Pick Type	window we use a search bar to locate SybaseTest_dbo_stores [TableDefinition.Types]	type. This completes our Form Design . We can save the Form and close Form Designer to return back to the Flow Designer. 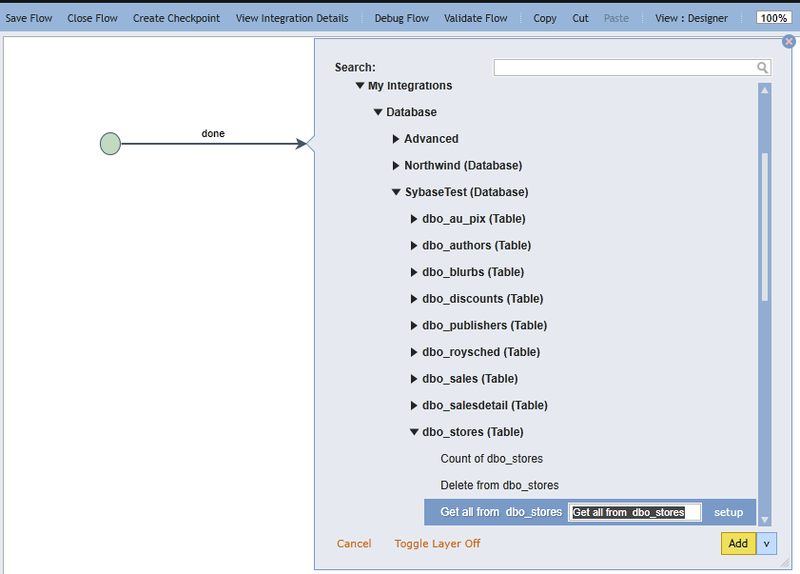 Back in the Flow Designer we locate Insert to dbo_stores	step from Integrations > My Integrations > Database > SybaseTest(Database) > dbo_stores(Table)	category in the Quick Add Step	dialog and connect it to the Done	outcome from our Form	. Next, we connect Failed	outcome from Insert to dbo_stores	step to the End Step	in our Flow . Then we add another Get all from dbo_stores	step to our Flow and connect it to the Done	outcome from Insert to dbo_stores	step. Again, we connect Failed	outcome from Get all from dbo_stores	step to the End Step	in our Flow . 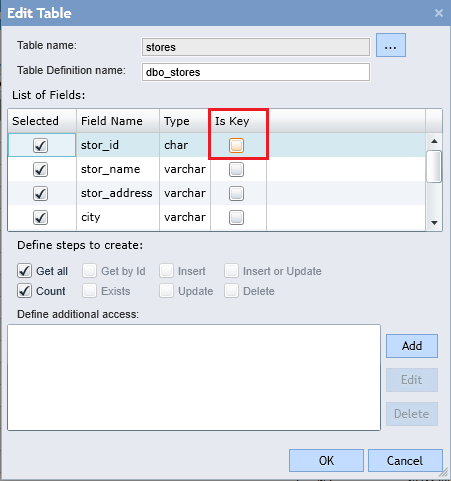 Then, we add another Form	to the Done	outcome from Get all from dbo_stores	step using [Pick or Create Form]	step. We select Show Mapping Editor	option from First Form&apos;s Actions menu to configure the Input Data into the Data Grid component in our Form . 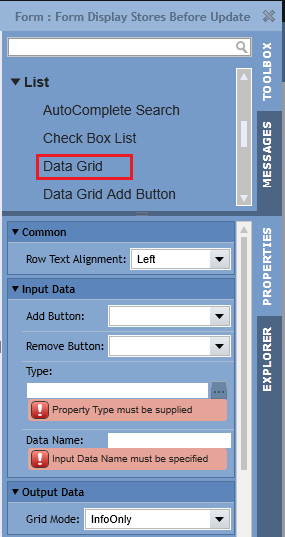 In the Mapping Editor	we connect stores_Result	(the outcome from our Get all from dbo_stores step ) to the Data Grid	variable in our Form . We click Ok	to close Mapping Editor. 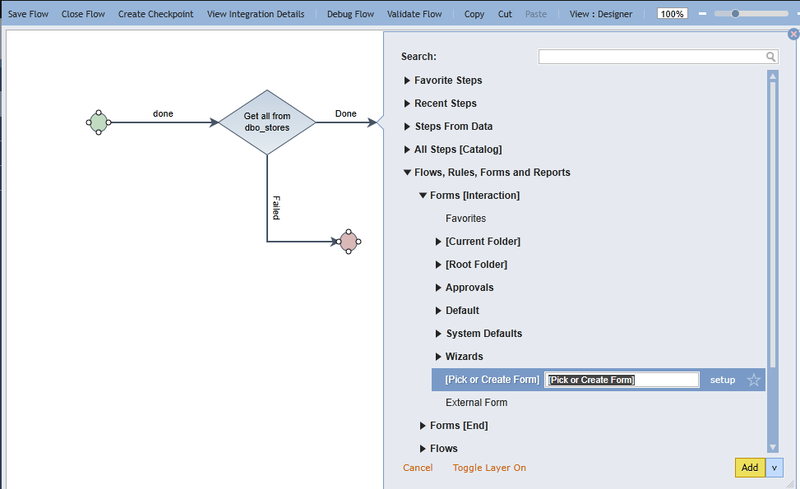 Back in the Flow Designer we call Show Mapping Editor	for our Insert to dbo_stores	step. In the Mapping Editor	we use Build Array	Mapping Type for the Inserted Objects	. Next, we use Build Data	option for the first element in the Array	. Next, we can define all fields in the database row as Constant	and provide with desirable values... Click Ok	when finished to save and close Mapping Editor. And configure its data mapping exactly the same as we did for the First Form . Click Ok	to save and close Mapping Editor. This completes our Flow. We click Debug Flow	link from the top panel in the Flow Designer to test our Flow . 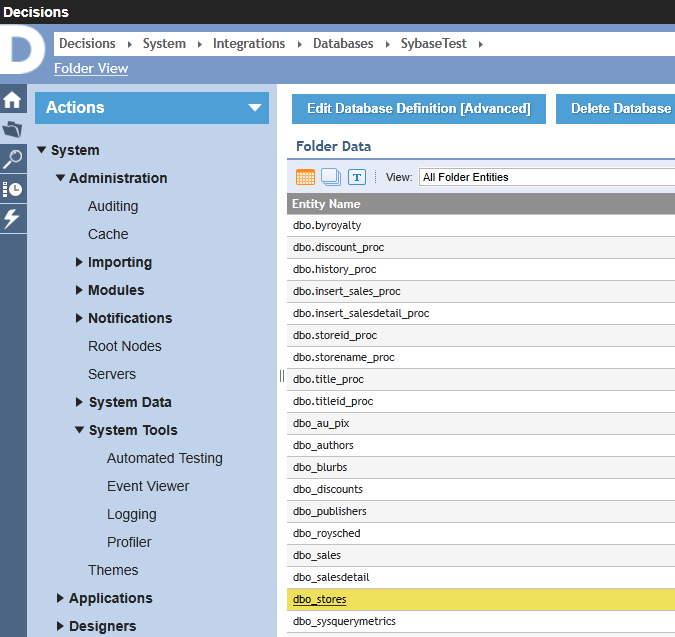 Note that in Decisions version 3.5 and above, you&apos;ll need to click on the Test Flow	link to access the Debugger. In the Diagram View	in the Debugger	we can see that our Flow ran to the End	step with no issues. If we query our database outside of Decisions we can see that a new row was added to the stores	table.